Plus taxes. For 12 Months w/ 24-mo. agmt. Autopay & Paperless bill req’d. $181/mo. in months 13-24 (subject to change). Regional Sports Fee up to $8.49/mo. is extra & applies. * See offer details. Enjoy the best of the best TV service with the DIRECTV PREMIER™ All-Included Package, and watch over 330 top networks and all channels from the SELECT™, ENTERTAINMENT, CHOICE™, XTRA, and ULTIMATE packages. 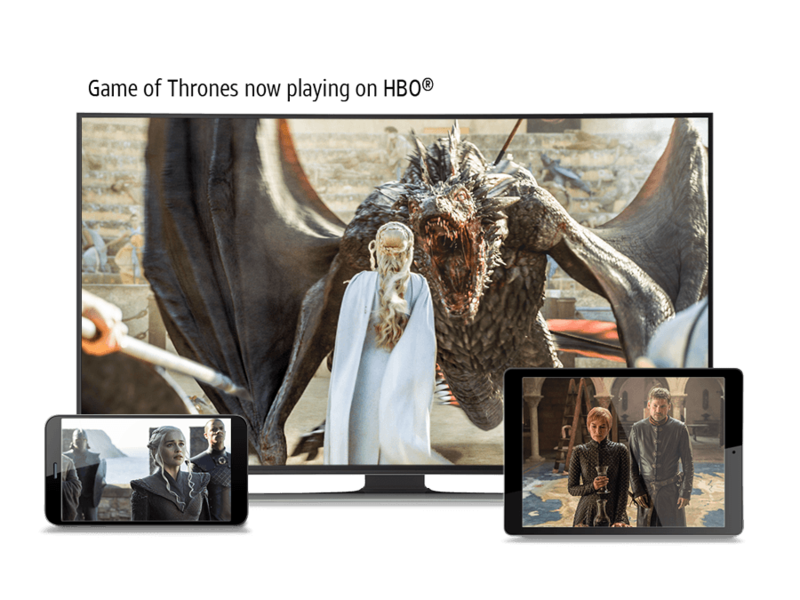 You’ll love the additional 35+ sports networks and 45+ premium channels that come with the PREMIER Package™ All-Included—including HBO®, Cinemax®, SHOWTIME®, and STARZ®. Get ENCORE®, HBO®, and SHOWTIME® included for the first 3 months at no extra cost with DIRECTV premium channels—including 8 Cinemax® channels and 15 STARZ® and STARZENCORE® channels. Plus, with pay per view options and On Demand movies and shows, you can watch what you want when you want. With SELECT through ULTIMATE Pkgs. After first 3 months, services continue at then prevailing rate (currently $53.99/mo.) unless you call to change or cancel. Req’s you to select offer. Live and breathe sports? Stream 90 UEFA Champions League matches and 300 regular season MLS matches, 90 out-of-market baseball games + MLB TV, 40 out-of-market basketball games + NBA League Pass, and live football every Sunday afternoon from your favorite teams with NFL SUNDAY TICKET and RED ZONE CHANNEL® with DIRECTV sports packages. Professional and collegiate sports subscriptions sold separately. Blackout restrictions apply and other conditions apply. Get instant access to over 45,000 shows and movies to watch anytime, anywhere, including premium programming on STARZ®, HBO®, SHOWTIME®, and Cinemax®. Plus, watch your favorite shows when your schedule allows, and even catch select series and movies up to a month before they air on Netflix. †Based on Nationwide Study of representative cities. Why Use the DIRECTV App? If you’re a sports fan, you’ll also love the NFL SUNDAY TICKET App (included with NFL SUNDAY TICKET)—so you can stay in the loop and stream every live out-of-market game. NFL SUNDAY TICKET subscription sold separately. 1DIRECTV App and Mobile DVR are available to U.S. Residential DIRECTV customers (excludes Puerto Rico and U.S.V.I.) who stream on a compatible device using the DIRECTV App. App uses location info. 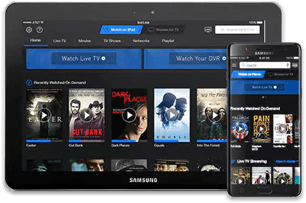 To stream from your DVR you must have a Genie HD DVR model HR44 or higher that is connected to the Internet at the time you stream or download from it to your device. To download, your mobile device and DVR must both be connected to your Wi-Fi network. Wi-Fi data usage charges may apply. Some Limits: Mature, music, pay-per-view and some On Demand content is not available for downloading. Live streaming channels are based on your package & location. Your DVR can stream to one mobile device at a time. Rewind and fast forward not available on all channels. All functions and programming subject to change at any time. Claim based on 2001-2018 ACSI surveys of customers rating their own TV provider’s performance. No major subscription cable TV provider ranked higher than DIRECTV. DIRECTV customer service is available online and via phone to help with your every need. *$19.95 ACTIVATION, EARLY TERMINATION FEES ($20/MO. FOR TV; $15/MO. FOR INTERNET) FOR EACH MONTH REMAINING ON AGMT., EQUIPMENT NON-RETURN & ADD'L FEES APPLY. Price is after $5/mo. autopay & paperless bill discount for 12 mos. Discount starts w/in 3 bills. New approved residential customers only (equipment lease req'd). Credit card req'd. Restr's apply. ^Limited availability in select areas. May not be available in your area. Call or go to att.com/internet to see if you qualify. Get a $100 Reward Card* when you order new DIRECTV service! w/24-mo TV agmt. Redemption req’d. See offer details. $100 REWARD CARD FOR TV: Offer subj. to change and may be discontinued at any time. Requires purchase of qualifying TV package (min. $35/mo. for 12 mos. after Autopay/paperless bill discount that starts w/i 3 bills. Prices higher in 2nd year) through DIRECTV Plans and card fulfillment. Qualifying Packages: SELECT or above, OPTIMO MAS or above, PREFERRED CHOICE bundle. For new residential customers in the U.S. (excludes Puerto Rico and U.S.V.I.). Residents of select multi-dwelling units are not eligible for this offer. Reward Card: Will be sent email or letter with redemption requirements. Redemption req’d. w/in 75 days from reward notification mail or email date. Reward Card delivered within 3-4 weeks after redemption to customers who maintain qualifying service from installation date and through reward fulfillment. Card expires at month-end 6 months after issuance. No cash access. For cardholder agreement, go to rewardcenter.att.com. AT&T Reward Card issued by U.S. Bank National Association, pursuant to license from Visa U.S.A. Inc. Ends 6/30/19. By providing your email address, you hereby consent to receiving emails from DIRECTVPlans.com. Keep an eye on your inbox for the latest deals. *All DIRECTV offers require 24-mo. TV agreement. $19.95 ACTIVATION, EARLY TERMINATION FEE OF $20/MO. FOR EACH MONTH REMAINING ON AGMT., EQUIPMENT NON-RETURN & ADD’L FEES APPLY. Price incl. PREMIER Pkg., monthly service and equip. fees for 1 HD DVR & is after $5/mo. autopay & paperless bill discount for 12 mo. Pay $115/mo. + taxes until discount starts w/in 3 bills. New approved residential customers only (equipment lease req’d). Credit card req’d (except MA & PA). Restr’s apply. PREMIER ALL INCLUDED PACKAGE: Ends 6/30/19. Available only in the U.S. (excludes Puerto Rico and U.S.V.I.). 1st & 2nd year Pricing: $110 for first 12 mos. only. After 12 mos. or loss of eligibility, then prevailing rate applies (currently $181/mo for PREMIER All-Included), unless cancelled or changed prior to end of the promo period. Pricing subject to change. $5/mo. discount: Must enroll in autopay & paperless bill within 30 days of TV activation to receive bill credit starting in 1-3 bill cycles. First time credit will include all credits earned since meeting offer requirements. Must maintain autopay/paperless bill and valid email address to continue credits. No credits in 2nd year for autopay/paperless bill. Includes: PREMIER All-Included TV Pkg, monthly service & equipment fees for one Genie HD DVR, and standard pro installation. Exclusions: Price excludes Regional Sports Fee of up to $8.49/mo. (which is extra & applies to CHOICE and/or MÁS ULTRA and higher Pkgs. ), applicable use tax expense surcharge on retail value of installation, custom installation, equipment upgrades/add-ons (min. $99 one-time & $7/mo. monthly fees for each extra receiver/DIRECTV Ready TV/Device), and certain other add’l fees & charges. Different offers may apply for eligible multi-dwelling unit and telco customers. Geographic and service restrictions apply to AT&T Internet services. Not all speeds available in all areas. Call or go to www.att.com/internet to see if you qualify. 1-YR ALL INCLUDED OFFERS: Ends 6/30/19. Pricing: All-Included TV pkg pricing includes monthly fees for one Genie HD DVR and standard prof’l installation. $5/mo. discount: Must enroll in autopay & paperless bill within 30 days of TV activation to receive bill credit starting in 1-3 bill cycles. First time credit will include all credits earned since meeting offer requirements. Must maintain autopay/paperless bill and valid email address to continue credits. No credits in 2nd year for autopay/paperless bill. Pricing subj to change. $75 1-YR BUNDLE: 1st & 2nd year pricing: $75/mo for first 12 mos only. Includes SELECT All-Included pkg, Internet speed tiers (10M - 100M) & Wi-Fi Gateway. After 12 mos. or loss of eligibility, then prevailing rate applies (currently $121/mo. ), unless cancelled or changed prior to end of the promo period. $94.99 1-YR BUNDLE: 1st & 2nd year pricing: $94.99/mo for first 12 mos only Includes SELECT All-Included pkg, Internet speed tiers (10M - 100M) Wi-Fi Gateway and Phone Unlimited North America. After 12 mos., then-prevailing monthly rate applies (currently $140.99 /mo. ), unless cancelled or changed by customer prior to end of promo period. Must maintain all qualifying services and service addresses must match to receive advertised pricing. Exclusions: Price excludes taxes, applicable use tax expense surcharge on retail value of installation, equipment upgrades/add ons, and certain other add’l fees & chrgs. Different offers may apply for eligible multi-dwelling unit customers.